“Standing in pouring rain, on what I later learned was Badimara Street, Father Conway, the then Parish Priest of Sacred Heart, Pearce pointed to a number of steel spikes up from the biggest lake of muddy water I had ever seen and proudly said: "This is St John Vianney's". His enthusisasm was not contagious! This was November, 1970, and school began in January! The school began at the same time as the Parish and so to my question to Fr O'Donoghue (the newly appointed Parish Priest), "How do we buy our first stick of chalk? ", he took out his wallet and handed me $300 of his own money - which by the way we repaid some two years later. And so St John Vianney's began in the school hall at Sacred Heart School, Pearce with two teachers, 54 pupils, a box of coloured chalk, a box of white chalk, a set of coloured rods and a set of charts for Sr Tesesita's colour reading and the kindness of many principals who came to our aid with green exercise books and pencils. St John Vianney's was alive and well and thriving with enrolments having increased from 54 to 770. What made SJV so special? The spiritual leadership of the Sisters of Mercy, formed a faith community which derived it's inspiration from a belief in and acceptance of Christ and His call to the Kingdom”. 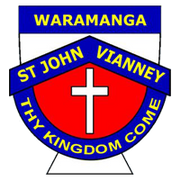 Classes commenced at St John Vianney's Primary School in 1971. On Sunday 19 September 1971.